Some years ago, I briefly toured the Midwest playing harmonica with Ralph Stanley and the Clinch Mountain Boys. Quite how an English teenager came to be there still mystifies me as much as it surely did the concert-going publics of Lawrence, Kan., or Des Moines, Iowa. In fact, my time among bluegrass royalty is only the second most improbable-but-true story of my life. The first is how, some five years later, I came be baptized into the Catholic Church, influenced largely by drinking with Dominicans. “The Hillbilly Thomists” is the eponymous debut album of a group of two Dominican priests and eight student-brothers, based out of the order’s House of Studies in Washington, D.C. Several hail from the sort of town that just sounds like it produces lightning-fingered mandolin and fiddle players: Gallatin, Tenn.; Libertytown, Md. ; Henderson, Ky. The ensemble, founded in 2013, takes its name from one of Flannery O’Connor’s famous self-descriptions: “Everybody who has read Wise Blood thinks I’m a hillbilly nihilist, whereas...I’m a hillbilly Thomist.” Don’t you just love them already? Even banjo pickin’, in the hands of the Order of Preachers, can be an exercise in ressourcement. It gets even better. The album cover consists of a slightly blurred portrait in black-and-white (though with Dominicans, who could tell?). Thirteen friars sit formally with their assorted instruments. All but one stare blankly at the camera, as though fearing the photographer might steal their animae with that thar new-fangled contraption. It looks for all the world like a daguerreotype dug up from John Lomax’s attic. In truth, it is an archival photo of music-making Illinois Dominicans from the 1920s. Even banjo pickin’, in the hands of the Order of Preachers, can be an exercise in ressourcement. From Alpha to Omega, this is bluegrass of the highest order. The album’s penultimate track, it serves as a by-now much-needed reminder that crafting bluegrass perfection is not, after all, the Hillbilly Thomists’ day job. 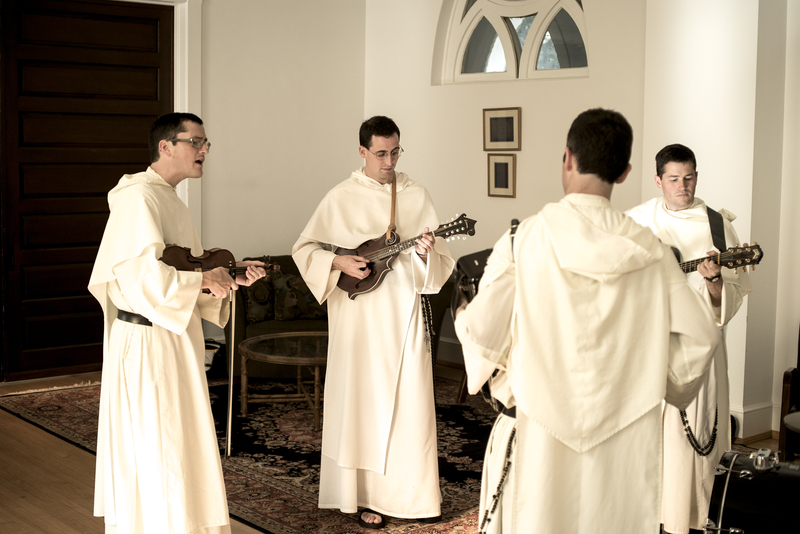 That said, the friars’ religious vocations and their musical avocation are not without a natural affinity. The Appalachian oeuvre is, of course, already imbued with a deeply Christian sensibility. Indeed, several of the songs here possess more kerygmatic oomph than I would guess some parishes hear in a month of homilies: “What Would You Give In Exchange for Your Soul?” being a case in point. In the hands of experts in both preaching and liturgical singing, these well-worn folk standards reclaim the fervor and sincerity with which they were first written, sung and faithfully passed on by Christians past. As we have already done with the great treasures of Anglican and Methodist hymnody, there is a great deal in this (predominantly) Baptist patrimony with which to complement and enrich the Catholic “treasure of sacred music” (“Sacrosanctum Concilium,” No. 114). All of which raises an intriguing thought experiment—albeit one I hesitate to moot in the august pages of America. Just suppose that the Hillbilly Thomists had come along 50 years earlier. How different might today’s parish liturgies be if they had been influenced rather more by Dominicans from Appalachia, than by Jesuits from St. Louis? Banjo Picking for Jesus resonated with my experience as a Director of Spiritual and Religious Care (Chaplain)at St Josephs Hospital in Saint John NB Canada. I grew up in Winnipeg and attended a Jesuit High School and Parish. Shortly after high school I began playing guitar at mass and found a deep connection to the St Louis Jesuits music... Take Lord, I Lift Up My Soul and others. Forty years later I continue to play those tunes on my guitar. Four years ago I struck up the banjo, playing and singing in a claw hammer style. I mainly play the "Old Thyme" music at the Ecumenical Service but I also fit the banjo into mass as well. One arrangement by the SLJ is "How Can I Keep from Singing" This goes very well with mandolin, guitar and banjo. What has been most life giving for me and others is when patients and families request I play the banjo in palliative care settings. There has been moments when the patient is comatose, not seeming to respond, but I look at the white sheets at the end of their bed and their toes are tapping to the bum ditty beat of my banjo, singing Amazing Grace and others. A family member who did not know me told me after a funeral, that when she saw me walk in with a banjo thought "What is he doing with that, here?" But later told me how uplifting it was to hear, their loved ones old favorites, played and sang on the banjo. This article also appeared in print, under the headline "Banjo-pickin’ for Jesus," in the February 5, 2018 issue. Stephen Bullivant is a professor of theology and the sociology of religion and director of the Benedict XVI Centre for Religion and Society at St. Mary’s University in London.